Daimler Trucks is in the middle of another new product test program ahead of the launch a new Fuso Heavy Duty range which is due to land in Australian dealerships. around the final quarter of this year. 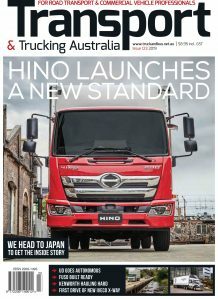 Truck and Bus News had the chance to have a sneak peek driver of the new Fuso Heavy this week of a 250 km test run on the Hume Hwy, sampling what is a truck that complies with Japan’s PNLT standard (similar to Euro 6) and which will be the first large scale overhaul of the Fuso flagship in almost nine years. The truck we sampled was powered by a new Fuso 10.7 litre straight six turbo diesel mated to Fuso’s version of Daimler’s D12 12 speed automated transmission and using steel suspension with a 4.66 final drive. The truck was coupled to a tri axle single trailer loaded with concrete blocks to a GVM of 38 tonnes. Inside there has been an overhaul of the dash and interior design matching up with Daimler’s move to unify the electrical ad electronic architecture of all its truck and bus models. Subtle reminders of this include similar switchgear to Daimler and Freightliner models and while the gear selection for the 12 speed automated box is on the left hand side of the column it is the same selector you will see in its sibling Benz Actros models and across the Freightliner range. 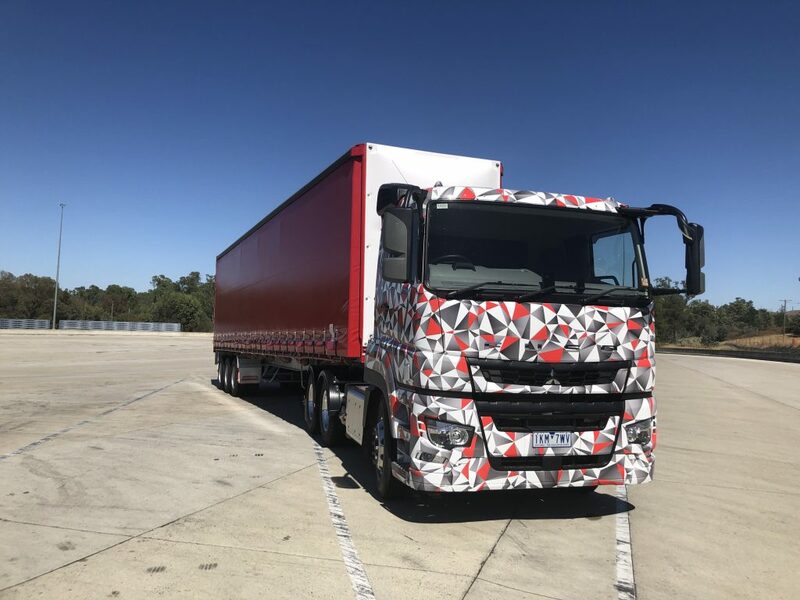 We saddled up and headed out on the Hume north from Albury with Daimler’s senior manager product and engineering for Fuso, Romesh Rodrigo in the passenger seat to point out some of the changes that will come when the truck is launched later in the year. The first and most obvious thing that strikes you in driving the Fuso test mule is the very low noise levels inside the cabin. The truck we were in complies to the Japanese Post New Long Term (PNLT) rules although the Produciton trucks will be Euro 6 compliant. Either standard means the need to lower both exterior and interior noise levels and that alone should be something drivers and other road users should be cheering for. It just makes things a while lot easier and also reduces fatigue over a day at the wheel . Conversation in the cab was easy and even on the biggest hauls up hills and on take off the noose levels were incredibly low. The second thing that hits is the performance of the smaller 10.7 little engine which will replace the 12 litre in current Fuso Heavies. It puts out a surprising 460hp and 2200Nm . The engine felt really flexible and was able to hang on on some of the bigger hills on the Hume including Aeroplane, cresting that in 10th and barely out of breath. Admittedly the truck had a slow speed diff with a 4.66 ratio which is well suited to urban and lower level intra-state regional distribution work but the reality is the truck still hauled its 38 tonnes of burden up these hills with a great deal of strength from a lower capacity and with pretty strong economy. We were able to see 2.1 km/ litre on the 250km run which from a truck with barely 2500km on the clock was a pretty good result. Romesh Rodrigo points out that the new Fuso flagship will be lighter than the truck it replaces and while the truck we tested was fitted with steel suspension the range will include air bag suspension and of course rigid models as well as prime mover spec. The Fuso engineer says that for some operators in rural areas steel suspensions is a strong option over airbags which seem to have become the industry standard. From our perspective the steel suspension ride was excellent and while not as comfortable as airbags was still very good and more than acceptable. Fuso currently has three trucks out in the field completing testing duties with its engineers and with operators and final spec is currently being decided based not he results of the tests and feedback from operators ahead of the new truck’s launch later this year. An interesting fact bowled up by Romesh Rodrigo on the drive was that Fuso actually sold more over 400 hp heavy duty trucks than any of the Japanese makers in Australia last year shifting around 300 units. The key here is ‘over 400hp’ for while Isuzu sold more Heavies than its rivals many of them came with 360 hp engines. Certainly if the production trucks of this new model perform they way the test mule did Fuso is likely to have another winner on its hands. Although a brief drive we were impressed with the Fuso and we look forward to driving the final production spec when it is launched. We will keep you posted on the progress of the new Fuso models over the coming months.